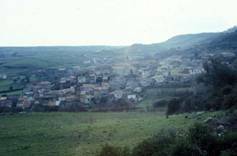 “Monteruju,” Sardinia – a town in the central Logudoran Plateau. This photo was taken in the winter, so the countryside looks green from all the rain. Monteruju has a mixed economy: pastoralism and small-scale agriculture combine with service jobs and light industry, mostly the produciton of cheese. Click here to see “Monteruju’s” own webpage. Santa Maria di Runaghes, a country chapel where a festival in honor of the Madonna is celebrated every September 8. The 17th century chapel is built on the ruins of a nuraghe, dry-stone towers or forts that characterized Sardinia from the late Neolithic to the late Bronze Age. One of the festivals in The Two Madonnas takes place at this chapel. 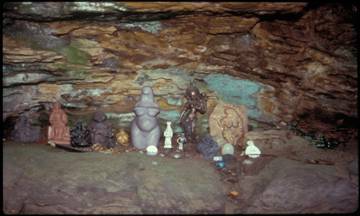 Santa Maria di Runaghes is found only in Monteruju; she protects sheep, shepherds, young women and children. Procession from the festival of the Assumption of the Virgin, August 15. These young girls are wearing the regional costume of Sardinia: long woolen skirts, white cotton blouses, embroidered doublets and black cotton aprons. This folk costume was developed in the late 1800s after Italian unification; it never represented what women wore in their everyday lives. Today it is worn as a symbol of local and regional identity. Many tourists and returning immigrants attend this celebration and enjoy seeing the costumes on parade. Earth Mother Shrine, Mt. Horeb, Wisconsin. Neo-Paganism is a term that covers a variety of religions that revive, reclaim and experiment with pre-Christian forms of worship. They typically combine elements drawn from a variety of other cultures and religions. In this outdoor shrine to the Earth Mother goddess at Circle Sanctuary, goddesses (or simply female figures) from many different cultures and historical periods are juxtaposed. Viewers are invited to see them all as variants of a similar idea: that the earth is personified and protected by a female deity. Gaia sculpture by Oberon and Morning Glory Zell. 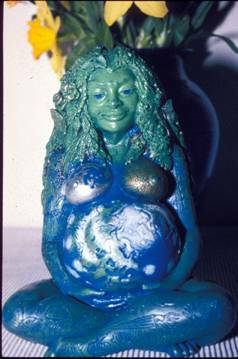 Following the lines of the idea described above, that the earth is a goddess, artist Oberon Zell created this resin sculpture showing our planet as the belly of a pregnant Mother Earth, or Gaia, as she was called by the ancient Greeks. On Gaia’s breasts, the moon and tides are depicted, while the evolution of life on earth is portrayed along her hair and limbs, beginning with the simple and moving towards the more complex: Neo-Pagans do not see a contradiction between evolution and the idea of a universe created by goddess. Gaia’s navel is at Delphi, the sacred Greek site of the temple to Apollo also known as the omphallos mundi, the world’s navel. Gaia’s features reflect a combination of the physical attributes of all human racial groups: all women’s faces are reflected in hers. 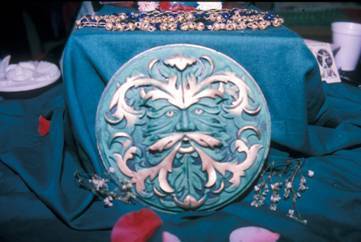 The Green Man sculpture, by Oberon and Morning Glory Zell. Neo-Pagan goddesses have their counterpart in the figure of the god, here depicted as a Green Man, or vegetation deity. The god is often portrayed as both the son and lover of the goddess; he is born every spring like the fruits of the earth, matures through the summer and early fall, and returns to the Otherworld when the leaves fall from the trees in the autumn, only to be born anew in spring. This cycle forms the basis of much of modern Pagan mythology; but it is based on the sacred stories of many ancient gods, such as Adonis, Tammuz and Dumuzi. Sometimes the god is shown as having horns; in that form, he is Lord of the Animals and the hunt, ruler of life and death, comforter and consoler. The Horned God has nothing to do with the Christian devil, who does not figure at all in Neo-Pagan religions. A Wiccan altar. Altars are places where humans create, maintain and negotiate their relationships to the sacred; they are found in nearly all religions. 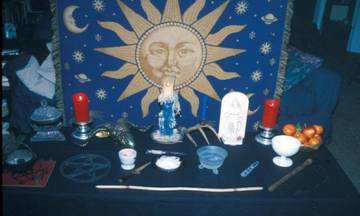 This Wiccan altar includes statues of the goddess and god, candles, and symbols for the four elements: earth, air, fire and water. The athames, or sacred knives, are not weapons, but symbols of the element fire. They are used to invoke the divine. The pentagram, or five-pointed star, symbolizes the four sacred elements plus spirit. The thurible (small cauldron) is used to offer incense, a symbol of air and fire, to the deities. Food on the altar is shared by all the ritual participants after the service as part of a sacred meal. Padstow, a town on the north coast of Cornwall, celebrates May Day every year with a unique custom: two hobby horses, or “osses,” dance through the town streets, accompanied by drums and accordions. The entire town participates in this exciting event, which has now become a tourist attraction, drawing over 30,000 visitors each year into this fishing town of 3000. Folklorists Alan Lomax and Peter Kennedy visited Padstow in 1952, producing a film called “Oss Oss, Wee Oss.” In 2004, film maker John Bishop and I returned to Padstow to see how the custom was faring fifty years later. 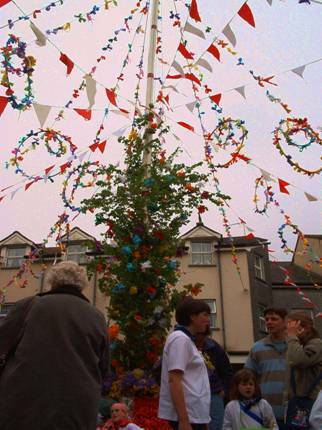 The town Maypole is decorated with greenery that young people bring in from the woods very early on May morning: sycamore boughs, bluebells and cowslips, traditional harbingers of spring in Britain. There’s no Maypole dancing, but later in the day the town’s two hobby horses meet and dance at the Maypole as the townspeople and tourists look on. The Blue Oss is shown here, being led by a woman teaser. 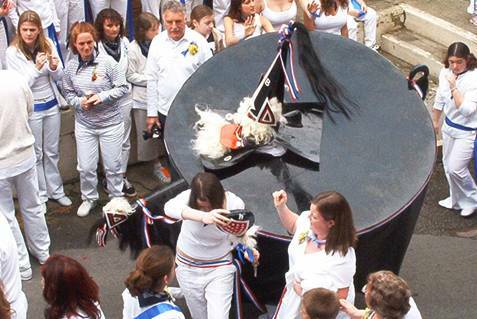 The roles of oss and teaser are usually passed on from father to son in certain old Padstow families, but the Blue Oss Team has recently allowed women to tease and even carry the oss. The strange-looking hobby horse almost certainly originated in the late Middle Ages as a popular entertainment that imitated the jousting horses of royal tournaments. Similar costumes were once popular throughout Europe, and were part of the license and merriment that characterized festivals in the spring cycle, from Carnival to Pentecost. 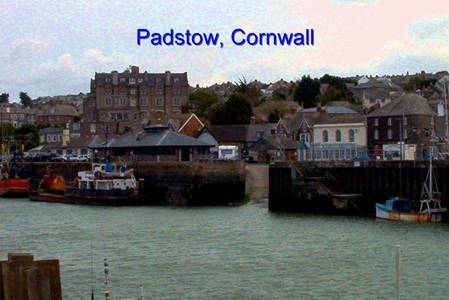 Hobby Horses fell into disuse during the 17th and 18th centuries in most places, but Padstow may have either maintained its custom under the radar of Oliver Cromwell during the Protectorate, or revived it in the late 1700s or early 1800s. Despite legends that claim the oss is an ancient pagan fertility symbol, historical documents of the celebration only go back to 1803. The observance of May Day is, however, quite ancient, and is found throughout northern Europe as a marker of the spring season. 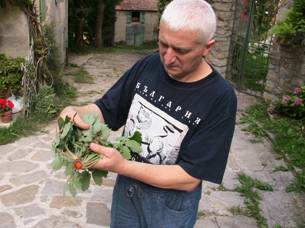 An herbal healer in Monghidoro, Emilia-Romagna (Italy) demonstrates the uses of a plant. There are two types of folk healing in Italy: herbal healing, which makes use of plants, and spiritual healing, which relies on prayers, charms and the help of saints and occasionally other spirits. Healers may specialize in one area, or combine both types of healing in their work. Vernacular healing in Italy is part of a widespread European tradition called “cunning craft” in English. A shrine to the Madonna at the foot of a spring; Emilian Apennine. Many spiritual healers rely on help from the Virgin Mary and the saints in their work. 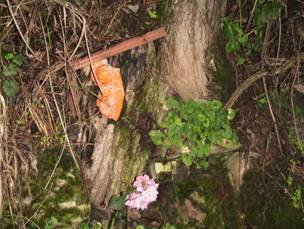 They sometimes maintain shrines to these spirits, leaving flowers and other offerings there. This shrine is located near a natural spring; in many parts of Italy, springs and water sources are associated with the Madonna. Some folklorists believe this reflects older patterns of associations that once belonged to pre-Christain deities, but this is difficult to prove. Healers almost always see themselves as working within a Roman Catholic tradition, however, and would be horrified if accused of venerating pagan gods. The mandrake is a plant with magical associations. It was once believed that its roots were shaped like a human figure, and that removing the plant from the ground would cause it to emit a lethal shriek (this motif was picked up by author J.K. Rowling and used in the “Harry Potter” books). 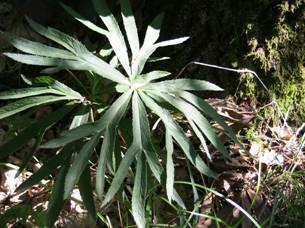 Herbal healers avoid it because it contains powerful toxins that can damage the nerves. In folklore, it is associated with witches. Tamurra players in Nocera Superiore, Campania. The tamurra is a large frame drum with metal jingles in the frame; it is related to the tambourine and other circum-Mediterranean frame drums. Musicians play an important role in Italian ritual life. 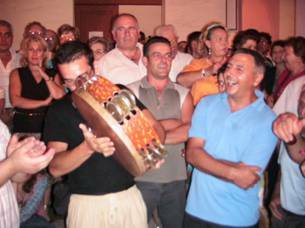 In some areas, such as Campania, the Salento and Sardinia, groups of musicians may be called in to help with ritual healing of certain ailments, such as tarantismo, and argismo. In other areas, playing for religious festivals is an act of devotion, as well as a service to the community, because musicians make people dance. Through dance, community members have a chance to work out social tensions, express religious feelings, get in touch with powerful emotions, and enter into alternate states of consciousness. Today, tamurra players are much in demand as these dances are undergoing an important revival in southern Italy. No longer just local, festivals draw on a transnational audience of returning immigrants, tourists and tamurra “ravers” who party all night long to the insistent beat of the drums. The songs which accompany the drumming deal with sacred and profane love.